Besides all the fun travel stuff and great adventures on the road and at sea, there is a technical side to both RVing and cruising. Whether your home floats or rolls, if you are going to live in it for extended periods, it will need some customization to make it function well and be comfortable as a home base. RV Awning Installation and Repair How to install & repair an RV awning? A step-by-step guide for how we tackled the tricky job of replacing our RV awning fabric. Amp’d Throttle Booster Installation and Review Amp’d Throttle Booster increases acceleration responsiveness and reduces “dead pedal” syndrome. Here’s our review on our truck. Repairing and Replacing RV Roof Vents After a Hail Storm! After a hail storm destroyed our RV roof vents, we had to replace them. Here’s a DIY step-by-step tutorial on how we did it. MORryde SRE 4000 Installation & Review – Smooth Trailer Towing MORryde SRE 4000 installation & review: A fairly easy install and what a fabulous upgrade for smooth trailer towing! RV Screen Door Modifications & Upgrades 3 easy DIY mods for an RV screen door to keep the cold out, to protect it from pets, to give it rigidity and make it easier to grab. 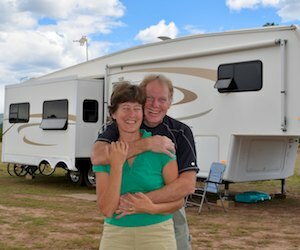 What are the Most Important Features in a Full-time Fifth Wheel Trailer?! What do you look for in a full-time fifth wheel Trailer? After 10 years on the road, here are the features we think are most important! Dirty Little Secrets from the RV Dump Station – RV Dumping Tips + Composting Toilets Most RV holding tank products are highly toxic. Are RV composting toilets better? How do you empty RV tanks & compost toilets? RV Mountain Driving: How to drive your RV safely on mountain roads Driving an RV safely on mountain roads is tricky. Here are a few tips we’ve learned about driving our RV on steep mountain passes. Trailer Suspension Nuts & Bolts – RV Blues on Rough Roads! Driving our RV on rough roads, the bolt for our 5th wheel trailer suspension equalizer almost came out. Yikes & What Next? Pocket Flashlight Review – Lumintop EDC25 & Lumintop SD26 Flashlights A review of two 1000 lumen LED pocket flashlights: the Lumintop EDC25 flashlight and the Lumintop SD26 flashlight. RV Plumbing Tips – Cleaning RV Faucets, Sink Drains & Shower Wands Here are some tips for cleaning your RV faucets, sink drains and shower wand to keep your RV plumbing in tip-top shape. B&W Companion Hitch Performance in a Fifth Wheel Trailer Rollover Accident In a fifth wheel trailer rollover accident the B&W Companion hitch kept the truck upright and the Hitchhiker trailer stayed intact. Is RV Solar Affordable? 3 Solar Power Solutions for RVs and Boats Is RV solar power affordable? Here are 3 cheap & easy solar kits for RVs and sailboats that pay for themselves in 1 to 9 months. RV Solar Power Made Simple Confused by RV solar power? This easy overview explains the terminology, components, design and solar parts selection for DIY RVers. What’s A Girl To Do at the RV Dump Station? Going to the RV Dump Station doesn’t have to be a one man job. Here are tips for how two people can share the fun. Hitch Tighteners – Anti-Rattle Hitch Clamps Stop the Creaks & Wiggles! A hitch tightener or anti-rattle hitch clamp stops the wobbling and creaking experienced with bumper hitches. Pics and info here. Power Inverters – Exeltech’s Pure Sine Wave Excellence What is a power inverter, what kind is the best, and how do you install one in an RV? Here are the details for why we chose Exeltech. How to Heat an RV in Cold Weather and Winter Snow Storms How do you heat an RV in winter snow and cold weather? Here are some strategies for heating an RV in storms at high altitude. How To Change The Inner Rear Tire on a Dually Truck Changing the inner rear tire on a dually truck is easy if you’ve got the right tools. Here’s a step-by-step guide for how to do it. One Ton Towing Machines and 75 Years of Trailer Life The 75th Anniversary issue of Trailer Life Magazine tells the history of RVing & gives tips for choosing a truck for heavy duty towing. 5th Wheel Trailer Suspension Failure – Replaced with our RV Warranty! A fifth wheel trailer suspension failure is a big repair job that costs over $2,500 but our RV warranty covered the replacement for $100! How to Put DEF (Diesel Exhaust Fluid) in a Truck & Which is Cheapest? Diesel Exhaust Fluid (DEF) refills are part of owning a newer truck, but which brand is cheapest & how do you put it in the tank? Edge Engine Tuner => Max Truck Power!! (Escapees Mag Feature!) An Edge Tuner will make a truck engine produce max power and be more fuel efficient, great for RVers towing big fifth wheel trailers. How to Defrost an RV Refrigerator in 20 Minutes! How to defrost an RV refrigerator in 20 minutes, a step-by-step guide. There are many methods for defrosting an RV fridge & this is easy! B&W Companion OEM Fifth Wheel Hitch Installation – Easy! Here is a step-by-step guide for installing a B&W Companion OEM Fifth Wheel Hitch in the bed of a Dodge Ram 3500 Dually truck. Easy! Dodge Ram 3500 Dually Truck – Best RV Fifth Wheel Trailer Towing The 2016 Dodge Ram 3500 dually, best in class, is our truck of choice to tow our RV, a 14,100 lb. fifth wheel trailer. Here’s why. RV Storage Tip – Making Space & Getting Organized in an RV Finding good storage space in an RV is a challenge. Here is a space saving RV storage tip we found that has really helped us get organized. RV Solar Panels – Flexible or Rigid? 12 or 24 volt? Mono or Poly? Yikes! Which solar panels are best for an RV or boat off the grid: Flexible or Rigid? 12 volt or 24 volt? Mono- or Polycrystalline? Here’s our take. Wet Cell vs. AGM Batteries & Wiring Tips for Installation on an RV or Boat! Flooded (Wet Cell) vs. AGM batteries? Here are the pros and cons for boat and RV battery installation plus wiring tips for optimizing. RV Electrical System Overhaul – New Batteries, Inverter & Converter! We are overhauling our RV’s 12 volt electrical system with new batteries, a bigger inverter and a better converter. A Mobile RV Service Directory – in a Free App! Go Mechanic is a free app that lists all the mobile vehicle service providers within 50 miles. Cool! How much inverter is enough? A mishap and blown up inverter send us back to the basics in our life off the grid. RV Tips – Cleaning Tips for Washing your RV Here are some tips for washing your RV to keep it sparkling clean even after years on the road. SunwayFoto Gimbal Head Review – Catching Birds in Flight! The SunwayFoto GH-01 Gimbal Head is a top quality carbon fiber tripod head that makes it easy to maneuver a long lens. Kuat NV Bike Rack Review The Kuat NV bike rack is an easy-to-use hitch-mounted rack that makes mounting, dismounting and locking the bikes a snap. Lumintop SD75 Flashlight Review – A Car Headlight In Your Hand! The Lumintop SD75 Flashlight is a powerful 4,000 lumen search light that’s awesome for RV camping and night photography. Choosing a Tripod – Sunwayfoto Tripod & Ball Head Review The heavy duty Sunwayfoto XB-52DL ball head is well crafted, and paired with the T2C40C tripod makes a great camera tripod kit. Hobie Mirage i14t Tandem Inflatable Kayak Review The Hobie i14t tandem inflatable kayak has been a fantastic boat for us, both in our RV travels and on our sailboat in Mexico.